Growing larger every year, the Walk for Life West Coast is anchored in a sense of fruitfulness, responsibility, and joy. When I first moved to San Francisco in April of 2000, one of the first places I visited was the magnificent gallery of Rodin sculptures at the Legion of Honor. The range of pieces there run from some massive bronzes to small intimate plaster and terracotta pieces. Every time I visit, I see something new, something that speaks to the pain, joy, grandeur, misery, and wonder of the human experience. Beauty has that effect on people. Showing the beautiful is difficult. If it isn’t genuine beauty on display, it’s usually the counterfeit gloss of the prettily sentimental—a much easier thing to create. San Francisco is home to many public demonstrations and parades, from the Bay to Breakers to the annual, much-hyped Pride Parade. But none of these demonstrations capture sheer beauty like the Walk for Life West Coast. And that’s why it keeps drawing people back, like that gallery of Rodin. The first Walk was in 2005 and drew around 7,000 people. I volunteered for security that first year, which also marked the most violent opposition the Walk ever faced. Abortion rights activists stripped and made obscene gestures in front of the pro-life crowd. They threw condoms filled with fake blood, eggs, and coat hangers. I was spat upon a few times, and got tackled from behind by one activist. 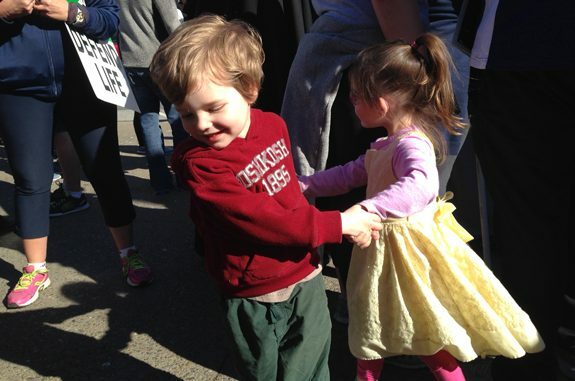 But remarkably, even the normally rather hostile mainstream press coverage reported how the pro-life marchers were striking a friendly, even joyful tone, ignoring the opposing voices, singing and praying as they made their way from the Embarcadero along Fisherman’s Warf down to Fort Mason. As the Walk grew, the location moved to Civic Center Plaza. We now walk from City Hall down the broad stretch of Market Street, walking almost two miles to the Embarcadero. The opposition experienced the first year has dwindled to a handful of activists overwhelmed by the number of pro-lifers. This year the walkers were so numerous as to cover the entire length of the route; as the lead group arrived at Embarcadero the last few people emptied out from the plaza. During one recent Walk, groups of young people led a joyous shout that echoed down through Market, a wave of sound that turned heads from onlookers. In the years since the first Walk I’ve grown a lot; getting married and being blessed with three children, the youngest of whom was born on the anniversary of Roe v. Wade. He accompanied me to the Walk this year, one of the thousands of children that could be seen lining the streets of this city that is fast losing its population of families. I snapped a photo of him as he danced with his cousin to the music being played by a young friar with a guitar. These children are signs of human hope amid the growing number of rich, childless elite living in the area. Moving through the crowd this year I saw signs in Spanish, English, Chinese, Korean, Tagalog, Vietnamese, and other languages. The Walk for Life is one of the most diverse events you can find, with black Protestants, Orthodox, Hispanic Catholics, Korean Baptists, atheists, and agnostics all uniting for the message that life matters. Many come with musical instruments and play songs as they march. Others lead prayers. Teenagers chant. A couple of times I saw people duck out from the stream of walkers to hand money or food to the homeless who were begging on the sidewalk. Contrast the Walk to some of the other events in town. Two of the other biggest events are the Bay to Breakers and the Pride Parade, both are marked mostly by adults indulging in an excess of irresponsible behavior. They both represent fleeting pleasure. By contrast, the Walk for Life is anchored in a sense of fruitfulness, responsibility, and joy. Multiple generations can be seen, from the elderly to the very young. Grandparents pushing a grandchild in a stroller; a grandchild pushing a grandparent in a wheelchair. Fathers holding toddlers on their shoulders, mothers nursing babies. It’s a walking, talking rebuke of the barren hedonism that has taken hold in this area. That sense of joy is what keeps people coming back. It’s also what makes the Walk so special, and so beautiful. People who come always find something new, something else that speaks to the human soul. This year saw record numbers, with some estimates counting more than 50,000 people walking. The joy is also what keeps the volunteers going. Since I share an office with her, each year I watch as Eva Muntean goes through the incredibly arduous process of completing all the practical planning and work that goes into the event—planning that starts the day after the last year’s Walk has finished. She and the others who help make this event happen don’t get paid. They do this out of love. You can learn more about the Walk for Life West Coast on their website, see how you can help next year’s Walk happen, and plan ahead so that you too can experience this incredible event. So far, each Walk for Life has been the best one ever. Come join us!